Thankyou Rich for one of the most informative posts about this problem. I just received my Doran 360 and before i install it i am going to do what Dr. Luhr suggest. Hope the Doran remains silent for the trip home….. I wrote about tire stems back in November 2007 and found some good information. In a back-handed way, your tales of tires are describing a success story…. 100 years of research & development of tires has brought us to the point where the average car driver ignores the tires most of the time. Thanks to all those engineers …. But your circumstances (i.e, high-mileage) and rig seem to challenge the limits of tires. You didn’t somehow magnetize the steel belts in the trailer tires, did you? Try asking the next tire shop if they have a de-gausser they can sweep around your tires. But seriously, have you considered any of the goops that can be put into tires that fix slow leaks? Just curious; maybe they’re not as effective on high-pressure tires. Rich, I think I replaced the two valve stems in the tires I replaced in December of 2006. If so, there may be another culprit lurking here. There has been a recall of tire valve stems made in China over the last several years. It seems they dry-rot faster than usual, and can fail. 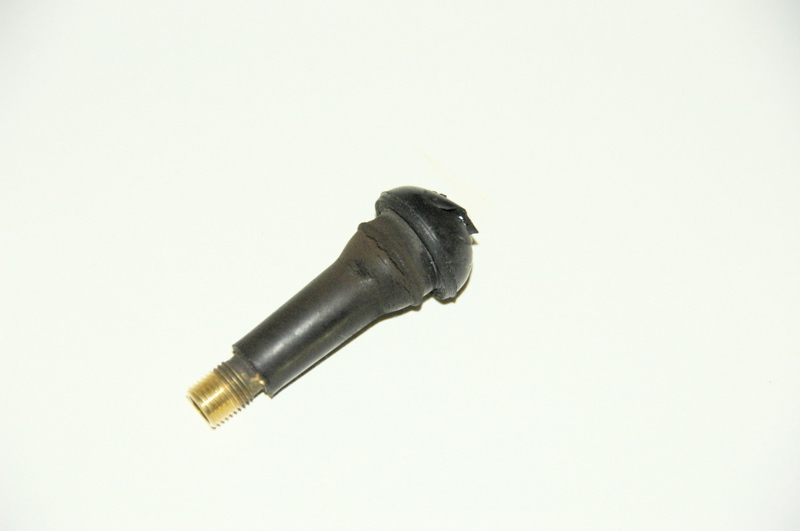 I went back and found your post about valve stems… We have joined the ranks of those who have had a rubber valve stem failure…but happily also had Pressure Pro tire pressure monitors in place to let us know something was amiss. This happened to us in city traffic in Mesa, AZ—we were lucky with respect to where it happened—as we were returning to Tucson from the Four Corners Unit Labor Day Rally in Williams, AZ… The first alarm showed the pressure had dropped to 49 lbs…and within seconds we had a 2nd level alarm showing only 14 lbs! Nothing slow about that! We changed the tire and were back on the road in reasonable time… The PPros helped us catch the problem before there was any damage to the tire itself. When we got back to Tucson the first thing we did was have the valve stems on our Bambi’s tires, including the spare, replaced with metal ones. No more of that! And long live tire pressure monitor systems!